Let me guess, you’ve just recently purchased a really cool-looking designer shag rug and now that you’ve lived with it for a couple of months, you’re realizing a couple of things. One - maintenance on these is a little more complicated than other area rugs. Two - shag rugs are hoarders! The longer the shag, the more it seems to gobble up and hide within the depths of its fibers! At Arizona Oriental & Specialty Rug Care, we’ve seen everything come out of shag rugs - bobby pins, LEGOs, coins, barbie doll shoes… You name it! So what’s a rug owner to do to care for their shag area rug? The first thing to note: you can’t really ‘vacuum’ a shag rug. But you can “dust” with pretty good success. The best way to do this is to gather up all your family members and take your rug to the back yard. Flip the rug over and vigorously shake the rug until you aren’t seeing anything else falling out of the rug. 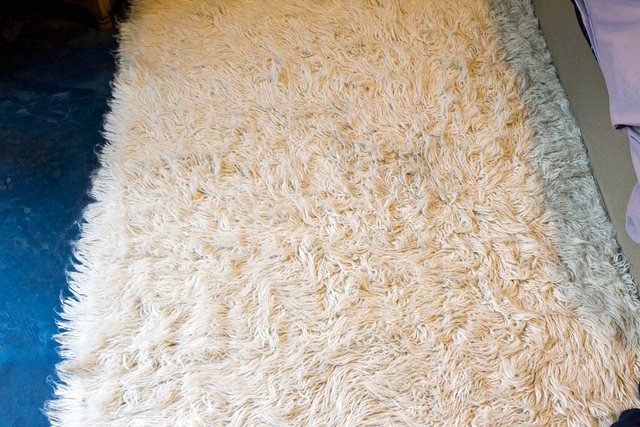 Shaking your rug out frequently will help you stay one step ahead of the dry soil. This will also help to preserve your rug’s life in the long-term as you’ll be removing a lot of the dry soil before it can work its way down to the base of those thick fibers. Dry soil is abrasive and grinds against fibers like sandpaper, thus making the rug “ugly out” before its time. The next step is to run a small shop vacuum’s hose over the fibers. You’ll need to be careful that the suction isn’t too strong for these fibers, as some shag rug fibers are more prone to coming out of the rug than others. Shag rugs are high-maintenance rugs, however, and there is really no substitute for a good, thorough cleaning from a professional rug washer like Arizona Oriental & Specialty Rug Care here in Prescott AZ. Some shag rugs require more frequent cleanings than others, and all should be cleaned more often than any other kind of area rug. Hopefully, these tips were at least somewhat helpful but if you need more help, feel free to give us a call or stop by our rug washing facility!